356 Glenbrook Drive, Lake Worth FL 33462-1017. Services for Captain FitzGerald will be conducted Thursday June 22nd with viewing the evening prior, in Mattapoisett, MA....please see obituary or visit the funeral home website for more information. Clifford Peter FitzGerald, 78, of Atlantis, FL and Mattapoisett, MA passed away at his home on June 13, 2017, from natural causes. Born in Newton, MA, the son of the late Helen (Carey) FitzGerald and John Joseph FitzGerald, he attended Newton High School where he met the love of his life, Ginnie Milott, on Christmas Eve. At Boston University, he was an outstanding hockey player who became Captain of the team. In his honor, his family created the Clifford P. FitzGerald Scholarship which is awarded annually to a top rising junior or senior Terrier defenseman. After graduating from Boston University in 1962, he and Ginnie were married and young Peter headed off to pilot training at Craig Air Force Base near Selma, Alabama as a Second Lieutenant. He went on to distinguish himself flying with the Strategic Air Command as well as the Tactical Air Command in Plattsburgh, NY, and Columbus, Ohio. During the Vietnam War, Captain FitzGerald flew more than 100 missions over Laos, Cambodia, and North Vietnam. Flying the WC130-A out of Udorn, Thailand and the Island of Guam, he was an integral part of a then-classified “Weather Modification” program to create thunderstorms to washout Vietcong supply routes like the Ho Chi Minh trail. After two tours of Vietnam, Captain FitzGerald left active duty with the Air Force in 1969, to fly for a new southern upstart company named Delta Airlines. With a brief stint as an Engineer on the DC-8, he quickly progressed to co-pilot of the DC-9, Boeing 727, and L-1011. 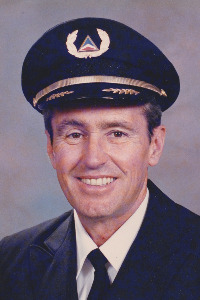 He was then promoted to Captain on the MD-80 and finally the Boeing 757/767. During his tenure with Delta, he assumed increasing positions of responsibility in the Air Force Reserves which culminated with him leading the Florida Civil Air Patrol and being promoted to Colonel. Throughout his over 20 years of military service, Colonel FitzGerald served his country with honor and distinction. By the time he retired from the Air Force in 1992, Colonel FitzGerald had been awarded numerous medals including the Legion of Merit, the Distinguished Flying Cross, the Meritorious Service Medal, the Air Medal with oak leaf clusters, the Vietnam Service Medal with 1 Bronze star for participating in over 29 campaigns, and the Vietnam Cross of Gallantry. He then retired from Delta Airlines in 1995 to enjoy life as a full-time racing aficionado, golfer, and summer time lobsterman. Preceded in death by his wife Ginnie, survivors include two daughters, Jacqueline “Lyn” Brown, and her husband Lawton, of McLean, VA, and Karen “Kira” Langolf, of Atlantis, FL; one brother, Paul Carey FitzGerald and his wife Jane of Sandy Hook, CT; and four grandchildren, Bradford FitzGerald Brown, Garrett Lawton Brown, Carey Amelienne Brown, and Brigette Adrienne Langolf. Wife Ginnie’s obituary................Virginia Grace "Ginnie" (Milott) FitzGerald, 68, of Atlantis, FL and Mattapoisett died February 3, 2007 at home after a courageous battle with cancer. Born in Newton, MA, the daughter of the late Adrienne (Messier) Milott and Paul E. Milott, Sr. She attended Newton High School where she met the dashing young captain of the hockey team on a blind date on Christmas Eve. Her high school sweetheart became her devoted husband of 45 years, Clifford Peter FitzGerald. She received her BA in Economics from Regis College in 1961 followed by her Masters of Arts in Education from Boston State College in 1962. She also taught special education students in the Needham School System. After marriage, she enjoyed the life of a military wife living in Selma, Alabama; Plattsburg, New York; Columbus, Ohio; and, the island of Guam. In 1969, the family moved to Miami, Florida. After several years as a homemaker, Mrs. FitzGerald returned to teaching at Pinewood Acres School and then became a school administrator. In 1978, the family moved to Palm Beach County. Mrs. FitzGerald became a volunteer at J.F.K. Hospital in Atlantis, FL and later retired as Director of Volunteers. Mrs. FitzGerald and her family have been summer residents of Mattapoisett since 1950. Surviving Hurricane Carol prompted her to write a book about the powerful 1954 storm entitled "Hurricane Carol: 50 Years Later - A Collection of Memories Past and Present." She donated the proceeds from the book to the Crescent Beach Improvement Association. My father, Pete FitzGerald (aka Clifford P. FitzGerald) who is also a retired Delta Captain and Air Force Colonel. Pete passed away peacefully at his home in Massachusetts this week. He had seemed in fine health, so it was quite a shock. ...................My dad was a retired Delta Captain and served over 25 years with Delta, a company and job he truly loved.